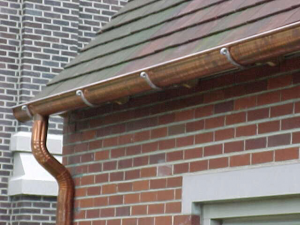 Copper gutter installed with copper stamped fascia brackets. 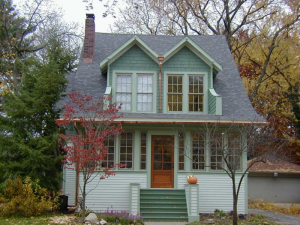 Copper gutter installed with solid brass open curl facia brackets. Soffit blocks provided by the customer. 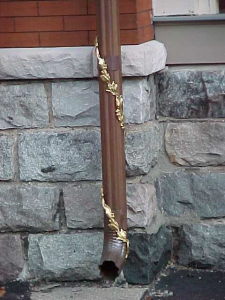 Aging copper down spout with gold painted – solid brass decorative down spout wreath wrap. 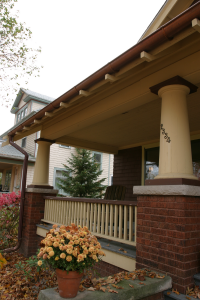 Aging copper gutter with an outside 90 degree strip miter, gold painted – solid brass gutter trim and decorative rain deflector. 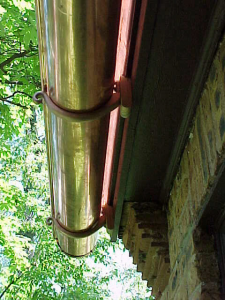 Aging copper gutter with copper endcap installed with hanger units. 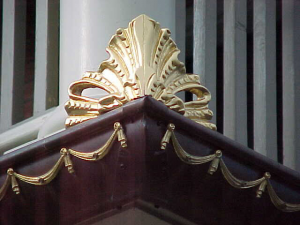 4″ corrugated round elbows and down spouts shown with copper gutter and solid brass open curl facia brackets. 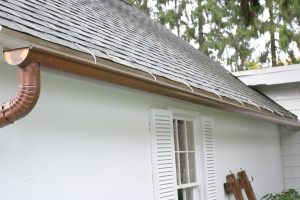 Aging 6″ copper gutter with stamped fascia brackets. Traditional copper collector box used to collect water from upper valley.